In smaller bedrooms, kids beds can all too easily overpower the room. Finding just the right bed that does not take up every bit of space can be frustrating. Luckily, once you have an idea of what to look for, there are a number of space savvy beds to consider that will give your little one a space to relax, sleep, and dream… without cramping or crowding. As we get a little bit further into the new year, join us as we share some of our beautifully made kids beds that are ideal for even the smallest of small rooms. The neat and compact Flant & Mungo Bed has clever storage shelves at its foot-end, which can be used to store bedside essentials such as books, alarm clocks, lamps, blankets, pillows, and other goodies. With its white and natural woodgrain finish, this bed is practical and stylish. With its simple design and hidden storage, the Lori Single Bed is ideal for children of all ages, from little ones to tall teens, because of its extra length. This elegant bed has a storage shelf hidden behind its headboard – ideal for books, nightlights, torches, midnight snacks, and other small items. Made from graphite, with a sturdy frame, oak legs, and an oak headboard, this bed will suit just about every decor style with ease. The Spot Double Bed including Storage Headboard is a great choice for teens and older children who have progressed to double beds. This contemporary bed has a storage headboard that features two easy-open storage cabinets, a shelf, and rails that can be used to hang organisers, decor, and other items. The white and wood look of this bed blends into any decor style, while there is also additional storage drawers available for underneath the bed. There is also a simpler version with plain headboard. Perfect for shared rooms, and for those who love to host sleepovers as well, the Adventure 3 Sleeper Bunk features two 3/4 beds on the top and bottom bunks, plus an additional single pull-out bed. 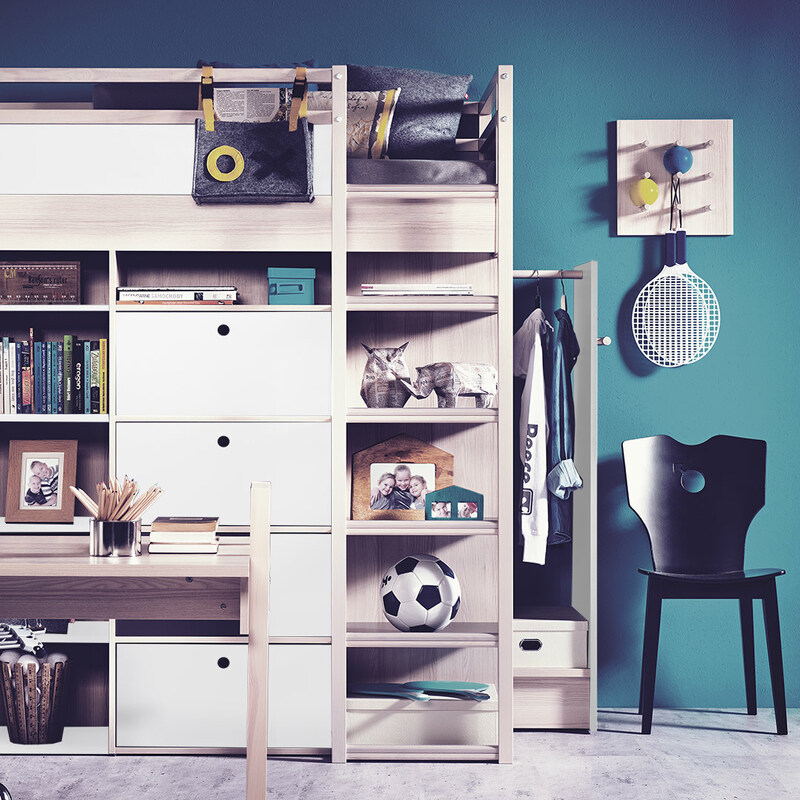 Warm wood is paired with modern white finishes in this versatile bunk bed, which is ideal for children of 6 years and up. 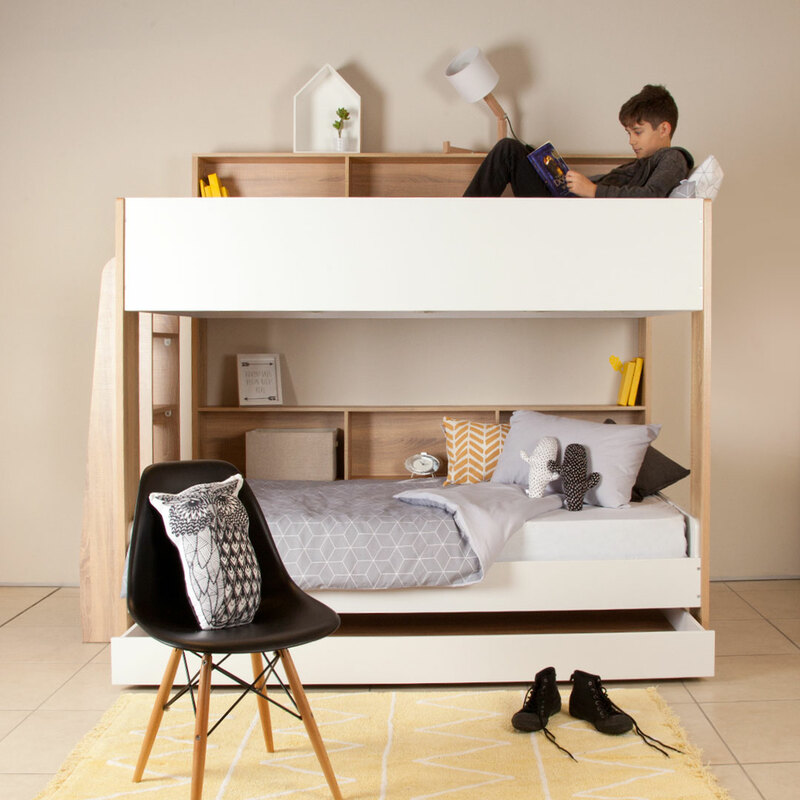 There are no snapping ladders – instead, the bed’s clever design ensures that kids can get up and down the bed safely and easily. With built-in storage, each child has their own private place to keep their essentials. Giving you an all-in-one solution that includes a bunk bed, chest of drawers, and bookcase, the Spot Bunk Bed is ideal for boys and girls. What makes this bed so perfect for small rooms is that it reduces the need for additional furniture. Books, clothing, toys, and other goods can be stored without taking up extra room. Add-ons such as the retractable clothing rail further enhance the use of space for this bed, making it the perfect choice for kids, tweens, and teenagers. 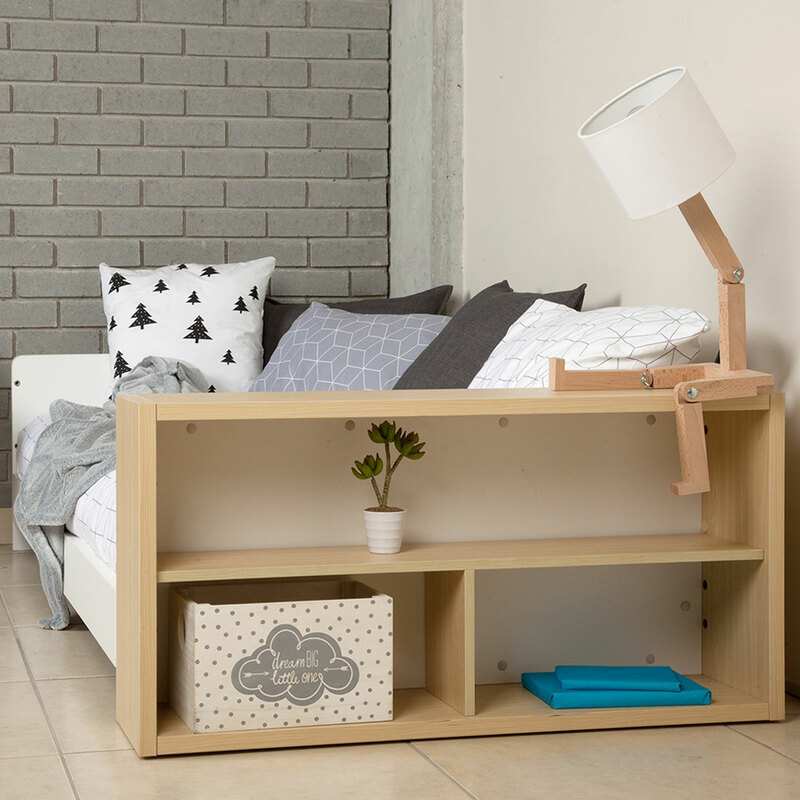 Even in the smallest of small rooms, these beautiful kids beds from Clever Little Monkey are sure to make the best use of the space you have available.